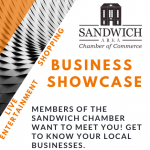 Members of the Sandwich Chamber want to meet you! Get to know your local businesses while enjoying shopping and live entertainment! This event is FREE for the whole family! Click HERE to see the Chamber Events Calendar.